Material Handling Equipment Market size was over USD 130 billion by 2017 and is anticipated to grow at a CAGR of over 5.5% from 2018 to 2024. Rising demand for sophisticated automated systems coupled with the ever-increasing labor costs is anticipated to contribute to the material handling equipment market growth over the forecast timeline. The use of traditional human techniques leading to reduced productivity and increased time consumption has stressed the need for companies to manufacture high-performance material handling systems. In addition, the demand for automated pick & place robots is on the rise since these systems can be controlled remotely, offering features such as precise operational capability, contributing to the material handling equipment market demand. The incorporation of advanced technologies into the equipment that ensures enhanced throughput is a key factor influencing the material handling equipment market growth. The integration of technologies, such as IoT, big data, cloud, and robotics, into these systems is encouraging their adoption across several industry verticals. The implementation of big data in material handling equipment is aggregating supply chain data and is driving improvements across several businesses whereas the incorporation of IoT into these systems is enabling the real time monitoring and tracking of products. High investment and maintenance costs associated with these systems are expected to hinder the material handling equipment market growth. There are high operational costs associated with the use of industrial trucks to ensure their smooth operations. The emerging trend of renting equipment than buying enables consumers to reduce the overall project expenditure is anticipated to hamper the industry growth. In material handling equipment market, automated storage and retrieval system (AS/RS) is gaining popularity and is expected to reach over USD 49 billion by 2024 as it facilitates several tasks such as the real-time inventory control, order picking accuracy, and safer operations. These systems enable fast load transfers at high speeds. Industries are increasingly using AS/RS over the manual order picking process to reduce labor costs and ensure efficient order fulfillment. Furthermore, AS/RS regularly positions and transports the essential inventory to a conveyor, manual outfeed, or an operator station and enables maintaining the real-time product tracking & identification. Storage equipment majorly includes shelves, pallets or racks onto which resources may be stacked in an arranged manner to await consumption or transportation. These systems provide increased storage capacity, improved inventory control system, and reduced labor costs. Increasing number of companies building new warehouses and upgrading the existing ones demanding these systems is expected to support the material handling equipment market growth. The material handling equipment market is witnessing growth globally with the growing demand in the e-commerce sector valued at over USD 14 billion in 2017. The integration of RFID tags and sensors into the equipment is facilitating error-free procedures and faster movement of materials. Material handling solutions provide flexible and scalable solutions to increase order accuracy, optimize productivity, and improve the order cycle times. The need for flexible distribution operations in warehouses has led organizations to implement automation in material handling applications to speed up the operations and meet the growing demands. Furthermore, the growing utilization of these systems in the durable manufacturing sector for several operations, such as storage, transportation of goods, picking, and placing of the object, is contributing to the industry demand. Asia Pacific material handling equipment market is expected to witness growth at over 6.5% CAGR. The growth can be attributed to the flourishing manufacturing sector in countries including China, Taiwan and India. Several government initiatives, such as Made in China 2025 and Make in India, are supporting the growth of the manufacturing sector in these regions. Increasing number of manufacturers is implementing robotic technologies to combat the rising labor costs and improve the productivity. Rapid industrialization, huge government investments, and strong growth in the foreign trade in India demand the availability of enhanced logistic and warehouses services, fueling the material handling equipment market growth. Rapid industrialization in the country coupled with huge government investments for infrastructure development will aid the industry growth. 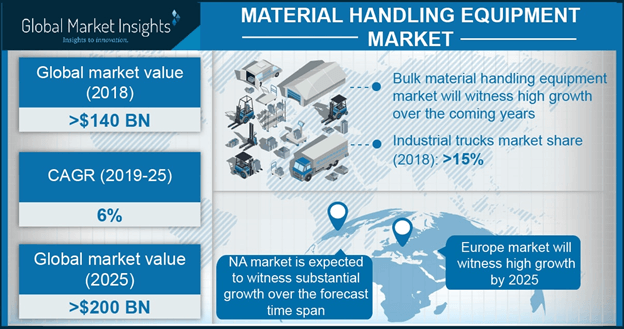 The Europe material handling equipment market estimated to be over USD 25 billion is anticipated to grow owing to several countries in the region gaining economic stability after the crisis, thereby supporting the industrial growth. Stringent government regulations pertaining to operator safety are compelling companies to utilize material handling systems for handling hazardous materials. The Health and Safety Framework Directive ensures a high degree of protection for workers. Key players in the material handling equipment market include Columbus McKinnon, Dematic GmbH & Co., KG, Flexlink, Daifuku Co., Ltd., Hyster-Yale Materials Handling, Inc., JBT Corporation, Kion Group AG, KUKA AG, and Intelligrated, Inc. Leading players are investing in the R&D of automated systems to enhance the productivity and launching new advanced solutions to strengthen their market presence. For instance, in March 2015, Daifuku Co., Ltd. invested USD 75 million in R&D to bolster material handling systems advancements. Increasing number of companies expanding their product lines and offering automation solutions is expected to drive the material handling equipment market. 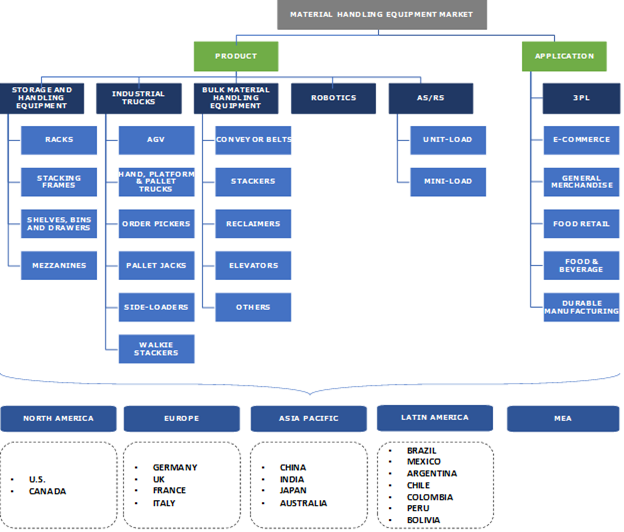 Strategic acquisitions to expand the market presence is a trend amongst the major players. For instance, in 2015, Columbus McKinnon announced the acquisition of Magnetek, which helped in augmenting its material handling applications and offering enhanced solutions. Growing demand for the storage & handling equipment, industrials trucks, AS/RS, and robotics across several industry verticals, such as e-commerce, 3PL, food retail, food & beverage, and general merchandise, is helping the material handling equipment market growth. The rising awareness about the benefits of automation is compelling companies to replace traditional techniques with new and advanced solutions. Several warehouses and distribution centers are optimizing the storage & picking by utilizing engineered systems such as sortation systems and pick modules. Robots also enable moving fragile or hazardous materials safely with reduced chances of errors. The expanding logistics and manufacturing domains are fueling the material handling equipment market. As human capital is becoming difficult to retain and recruit, automated material handling solutions are aiding companies in managing the labor challenges while ensuring profitability and productivity.